Scotland’s Rural Past (SRP) is a five-year, nationwide project, which was launched in October 2006, and hosted by the Royal Commission on the Ancient and Historical Monuments of Scotland (RCAHMS) in Edinburgh. In this short article I will tell you how the shameful footsteps of my north-east past brought me to one of the most fulfilling projects of my life. It is an extraordinary story involving the most ordinary of loons. This journey into my rural past started in Deeside, and to be exact, at the Spittal of Muick, the holding point, and ranger post, for high Lochnagar. It is likely, you as reader, will have been there. The very first inkling of this, a buried past, emerged in a soot encrusted wedge of legal papers lodged in an Edinburgh basement. These papers had been unopened since the day of trial in February 1830, and in the bundle was a trove of handwritten precognitions about a befuskert old rascal from Abergeldie. Donald Gordon was the last of a generation of smugglers, and had wide infamy for his brazen deceit. Inn after Inn, Deeside to Angus, he pedalled his ware of illicit Deeside whisky. It was as I untied the cloth ribbon that held the parched papers together that a delicate single note fell to the floor. It fluttered below me like a paper-dried butterfly as delicate as soot. 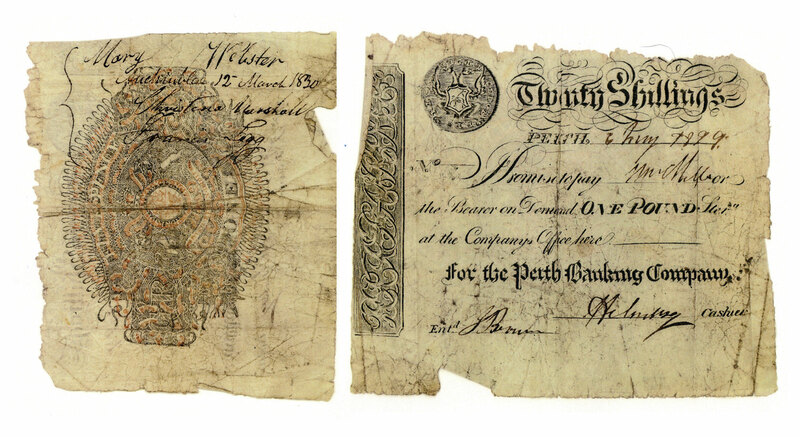 Close examination revealed that it was a twenty Shilling note from 1829. On the reverse somebody had hand-written in pen ‘Mary M. Webster, Auchenblae, 12th March 1830.’ My curiosity was stirred and in that moment of the fluttering note, I sensed the skulduggery of my befuskert uncle from a distant age. In all thirty two precognitions, all in copper plate, survived to tell the story of Deeside’s greatest rascal. It had taken the authorities twelve years to reprimand this man, such was his guile. In catching him no limit was set and they travelled the breadth of the country for two months, gathering witness statements against him. Donald was a survivor out-with his time, a stalwart in skulduggery, incapable of changing his ways even when the Guager gained clout by an Act of Parliament in 1824, and the illicit bothies of Deeside finally reeked no more. 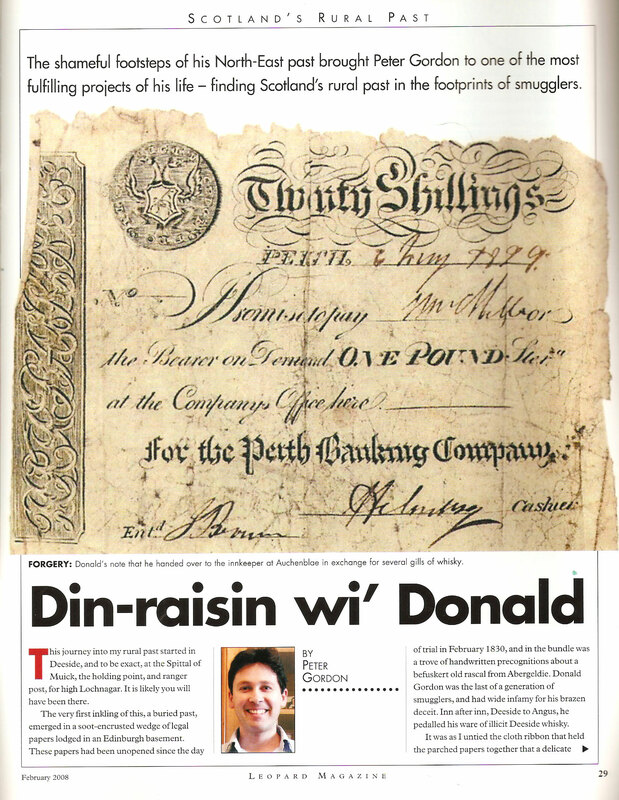 Without a supply of whisky, Donald, in desperation, turned to trade in counterfeit notes. I now believe he knew his time was up. Donald’s great friend was John Robbie of the Spittal of Muick and it was indeed through this partnership of ‘resourcefulness’ that they challenged each other to see who could first outwit the Gauger. In the Spittal and Inchnabobart, John Robbie had the ‘lookout’ posts of the glen, but Donald had the guile. You may have heard of Inchnabobart, it sits a stones-throw from the Spittal, by Loch Muick and is now secure as the Royal Howff for Prince Charles. It was, in the time of Robbie, the highest hostelry in Scotland. Robbie was born in Clova Glen in Angus on the farm of Fettereggie in September 1770 and he knew the road over the Mounth into Deeside better than any. It is clear that a’body kent Robbie. He was a raconteur and wit, and as Innkeeper of Deeside’s furthest outreach, he was the most convivial of hosts. Robbie was also a superb horseman, but en route home to the Spittal in April 1829, his horse shied and Robbie was thrown. Seriously injured he was taken to Ballater and nursed, but died the following day. Donald had lost his friend and one of the last of the smuggling generation. Befuskert his chaffs fell like never afore. You see, Donald had no family himself, and his sister, Elizabeth had turned her back upon him. You may be interested to learn that Elizabeth had married James Robertson (1789-1837), the smuggler-turned-good, who established the first Lochnagar distillery in Glen Feardar. This distillery was burnt down and then again after it was relocated to Balmoral. I for one find it hard not to wonder if Donald was involved; he must have seethed at the legitimate turn of trade taken by his brother-in-law. To Donald it was betrayal of a way of life and he at least, was prepared to risk all. Donald had the funeral wake of his life for his comrade John Robbie. The Spittal always celebrated death like no other. In the century before, lived a Jacobite of the name McDonald, and he had a grand two-storey country house at the Spittal. However when he died, months short of the rebellion, he left a vast fortune but no heirs. The folk of Glenmuick celebrated by dismantling his house with ruthless vigour; door-knob, pistol, bucket; it was all rouped away without trace. At the deceased’s expense, they had a funeral of wild abandon 30 pints of Ale were consumed by the ‘Company of Men’ who carried his ‘Corps six miles’ and then five and a half pints of Brandy at £1.10/- a pint plus four dozen pipes and three pounds of snuff. Gosh this funeral was like Hogmany in Edinburgh! But back to our befuskert Donald, for now, late 1829, his pal was deid; his way of life was gone, and he had been disowned by his family and by Deeside. So it was that he chose to drink his way into Angus, visiting every Inn en route. His conveyance, in desperation, was of course, counterfeit. That twenty-shilling note that fluttered to the floor was Donald’s. It was a forgery and one of many. At Auchenblae he handed it over to the Innkeeper, Mary Webster in exchange for several gills of whisky. In the stable next door he bought a horse. Thereafter we follow Donald’s journey, as emerges from the trail of 32 precognitions, in free abandon, from Pitmuies, Dower to Drumsturdy. It is clear that Donald drank and spent raucously before being apprehended by the Dragoon guard at the bridge of Murroes just outside Dundee. Like Donald, I have strayed off the path. This article set out to explain how I became involved in Scotland’s Rural Past. Well it was Donald’s fluttering forged note that started a paper trial worthy of the best of the history detectives. For the sake of brevity, I shall not lose you in detail, but rather drop you off at the castle of Abergeldy. It was here that I was introduced to the Deeside of Robbie and Donald. I understood from Reverend Stirton that John Innes had surveyed Upper Deeside in 1806 and that his map was preserved in Abergeldy castle. This castle has been in the ownership of the Gordon family since 1449, an unbroken record in our Nation, and one that brings us to the current Laird John Howard Seton Gordon. It was this Laird who invited me to his castle. With the largest key I had ever seen, he opened up the Great Hall and beckoned me to examine more closely the hand-coloured Innes map. In striving to see the Spittal, he urged me to join him by standing up on top of an old oak chest. I did so carefully, hearing the wood creak and groan. It was standing on top of the ancient oak seventeenth century Abergeldy charter chest in the Great Hall that sealed my fate, for I was transfixed. It was like a boy’s story; a forgotten map, a lost landscape and a rural past of secret stories. Examining the old glen townships, preserved in detail on the Abergeldy map, I did not really realise that I had begun a journey, as a history detective, or ambassador, of the now silent glens. Whistle-on a few years and with my first Deeside book near completion, I was sitting writing about the Spittal of Muick, when I heard on Radio Scotland a Grassroots program about the restoration of Auchtavan with its cruck frame and hingin’ lum. The group of volunteers had been pulled together, in part, by Scotland’s Rural Past, and listeners were invited to write in and volunteer. That I did the next day. Eight months later, and I found myself involved with one of the very first SRP groups, exploring the rural past, not of Deeside, but Glen Clova. 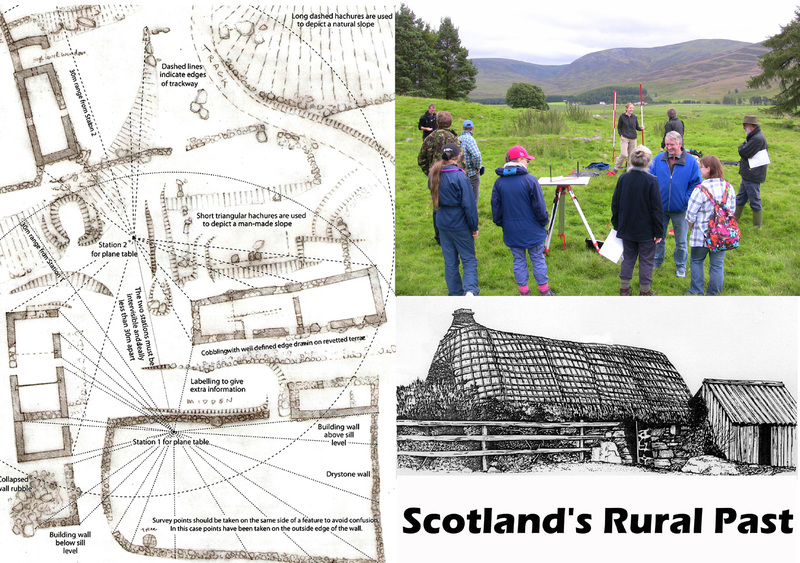 A wonderful array of volunteers, with all sorts of diverse backgrounds, had formed, and under the guidance of the SRP team, set out to record the lost townships of Clova. Our first field study was of the abandoned farm of Rochteth. Flora Davidson led us the way, living at the glen foot she has researched Clova’s history like no other. Fittingly, her son, Advocate General for Scotland, was recently made Lord Glen Clova. Yet Flora would not tell you this, for she is the unassuming champion of the common folk who once populated her glen. Her quiet enthusiasm is delightful. Match this, with the mixed skills of an eager team; geographer, archaeologist and farmer, then you might think success to be guaranteed? Well no, that could not be without the backbone of SRP. In particular Ishbel MacKinnon and Danny Dutton, who have garnered together this rag-bag, yet enthusiastic assortment, and taught us how to record our field studies. Furthermore the SRP team have provided us with all the resources of RCHAMS; covering historical document training, using the map library and aerial photograph interpretation. The Lindsay family that once lived in the cotterhouses of Rochtech had no high mantle, and survived mainly by subsistence, until one of the Lindsay girls became a dressmaker, married a teacher, and moved to Airlie. By 1861, Rochtech, had, as its only inhabitant an old widow and with her passing, Rochtech was abandoned. The farm was quickly subsumed by neighbouring Fettereggie, and the ruins of Rochtech were gradually reclaimed, leaving nothing but the stone footprints that we see today. My journey into Scotland’s Rural Past has been most rewarding and has brought me full circle. My son Andrew, aged ten, has joined us at Rochteth and has eagerly helped in the field measurements using Plane table and sighting rods. Today, I explained to Andrew, the smuggling circle. Befuskert Donald, our ancient rogue of an uncle, came over the mounth from the Spittal and plied every Inn that Angus allowed. His comrade in misadventure, John Robbie, was the Innkeeper at The Spittal and was born at Fettereggie in Glen Clova. It was Fettereggie that finished Rochteth. The circles of history are indeed surprising. Donald Gordon was sent to Prison in Perth. It seems he did not survive; he would not have been well disposed, with a shrunken, and cirrhotic liver.